So you know how in Frozen, we're all led to believe that Elsa and Anna's parents died at sea? Well according to Frozen co-director Chris Buck, they actually didn't die straight away—but rather were shipwrecked and had a baby when they washed up on the shores of a jungle island. They built a tree house to live in, lived life with their newborn son—and met a tragic end when they were later eaten by a leopard, leaving their children as orphans. For Disney fanatics who know how to take a hint, Chris' version sounds super familiar. Actually, it's pretty much EXACTLY what happened to the parents in Tarzan. Did we mention Chris also just happens to be the director of Tarzan? AGH. In an interview with MTV, Chris explained the origin of his mind-blowing theory. "When you're working on a feature, you have a lot of time to think about stuff because it takes four years to make one," he shared. "I think Jen [Lee, his co-director] and I were walking to a meeting, and I just start to tell her the entire story." Explaining his theory, he also revealed a major detail that makes the whole theory come together. "I said, 'Of course Anna and Elsa's parents didn't die,'" he continued. "Yes, there was a shipwreck, but they were at sea a little bit longer than we think they were because the mother was pregnant, and she gave birth on the boat, to a little boy. "They get shipwrecked, and somehow they really washed way far away from the Scandinavian waters, and they end up in the jungle. They end up building a tree house and a leopard kills them, so their baby boy is raised by gorillas." Wait, THE SON WAS RAISED BY GORILLAS? 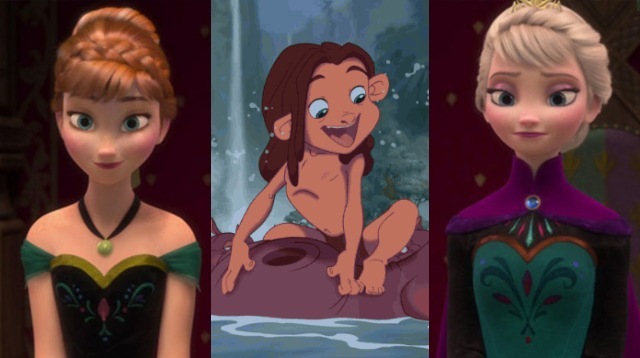 That's, like, the key information needed to confirm Tarzan is Anna and Elsa's little brother. Which is exactly what Chris thinks, too. "In my little head, Anna and Elsa's brother is Tarzan... That's my fun little world," he finished. "Whatever people want to believe, go for it," he said. "That's the spirit of Disney."